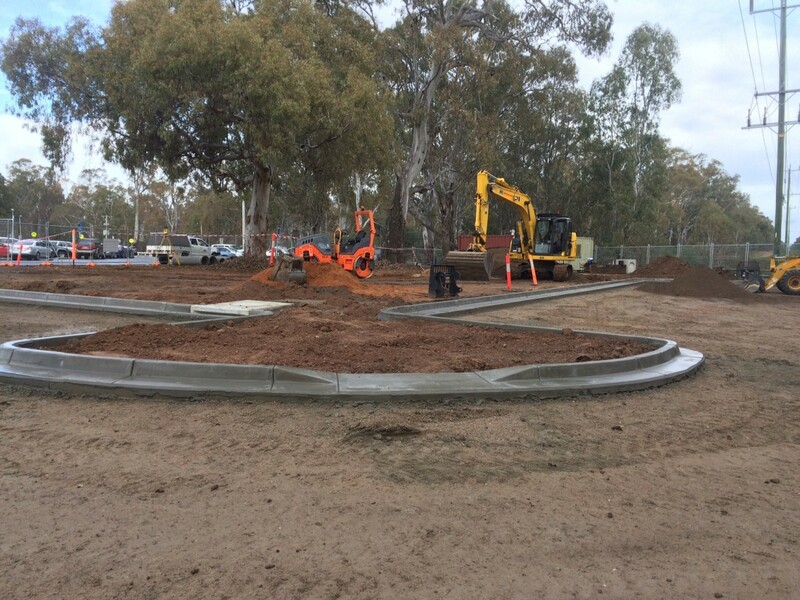 Progression of car park works - Aquamoves – Indoor and outdoor pools, fitness facilities and programs in Shepparton, Victoria. As you will have seen, Jarvis Delahey Contractors (JDC) are making great progress with Stage 1 of the car park development. The ‘L-shape’ parking area is looking great and work is continuing along Tom Collins Drive for the northern parking section. Powercor will be undertaking works on July 26 to relocate the stay cables for the power poles. Following this, JDC will ensure the ‘L-shape’ area is up to a level for use by vehicles, and then they’ll open it up and begin Stage 2. In the excavation works for Stage 1, JDC have come across gas lines, old Telstra pits, a buried red gum stump, buried red gum posts, slabs of concrete and a pot glass from ‘Clarks Hotel’. So it’s been an interesting process to say the least! Members and patrons are reminded that during construction there will be a reduction in the number of car parks in close proximity to Aquamoves, which will continue throughout the construction period. Contractors will undertake works to ensure that the maximum number of car parks can be provided at any one time, however this will cause inconvenience to members and patrons. We apologise for this inconvenience, however look forward to the completion of the project which will provide a greatly improved car park for members and patrons. Information on alternate parking options nearby to Aquamoves have been provided, and a temporary light tower has been located south of the roundabout to increase visibility and safety for patrons parking in this area. Information boards showing the final layout of the car park have been displayed on the temporary fencing in the car park and in the foyer area for members and patrons to check out. All efforts have been made to maximise the number of parks, traffic flow and pedestrian safety in this design. Could members and patrons please ensure that you obey traffic management personnel for the safety of yourself and others.